A Spicy Meatball: FuRaiBo. Rhymes with Tai Bo. The Westside is home to a variety of neighborhoods, each with their own distinct flavor. In my neighborhood, with its uninspired name of West LA, there is a little stretch of Sawtelle that my friends affectionately call NanoTokyo. Being about 1 billionth the size of Tokyo, give or take, it seems to be a fair assessment of the neighborhood, which over the course of about two blocks is filled to the brim with Japanese restaurants, along with a few other variations to spice things up. My current favorite restaurant in the area is called FuRaiBo. It’s located on the corner of Sawtelle and Mississippi, just caddywompus from the main strip mall on Sawtelle at Olympic. (Side note: caddywompus is delightful word that I learned while visiting the town of Solon, Iowa. It means “diagonally across” as in the restaurant is diagonally across the street.) As you enter FuRaiBo, assuming there isn’t a crowd of people waiting for tables and/or smoking out front, you’re greeted by a panoply of smells and a vibrant atmosphere of happy, satisfied diners. FuRaiBo serves Japanese bar food, meaning small plates of tasty treats served tapas style. 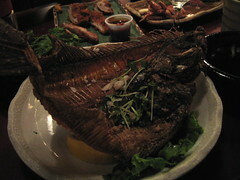 The most popular beverage accompaniment to the meal is a large Sapporo or sake. On this particular trip to FuRaiBo, I was treating my boyfriend and his friend to dinner. They had just helped me fetch my 75lb. 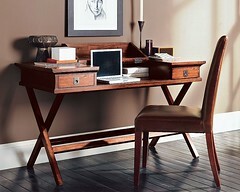 new desk from Pottery Barn (see picture) and assemble it in my apartment, and I felt that deserved a delicious meal. Knowing my boyfriend’s preference for Japanese food, I suggested this place just to see his face light up. On this particular night, we were seated promptly. Normally the wait is long, but during the week it seems to be a bit better. Upon sitting, we noticed the ad for sparkling sake sitting on our table and ordered a bottle immediately just to taste it. It was sparkly and sweet, with a light sake aftertaste. I liked it best on the first sip, and felt it had diminishing returns. But I’m not a big sake drinker, I prefer beer. For our meal we ordered a selection of dishes, from beef to squid to fish to veggies. My favorites were the fried halibut served in a deep fried fish dish, asparagus butter with spears of asparagus warm with butter, and eggplant with sweet miso sauce. I’m not sure how they make the miso sauce, but I’m pretty sure I could bathe in it and be a happy camper. The beef dishes were all delicious, except for the Beef Sashimi that I did not want to taste, although my boyfriend enjoyed it immensely. The squid was also a bit chewy for my taste (I'm a texture queen), but as squid goes, I was told it was quite good. Sadly, I have very few pictures from the meal because I forgot I even had my camera with me until after we’d made a little plate graveyard on our table. 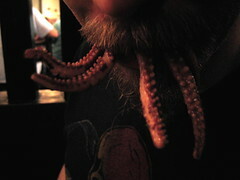 But I do have a picture of my boyfriend with squid lips. He is, as they say, a real kidder. The pleasure of dining at FuRaiBo is multifold. First and foremost, the food is delicious. Second, there’s something for everyone. And third, they’re open late, until 11:45pm every day except Sunday, when they're open until 10:45pm, which makes it a popular late night hangout that serves a welcome change from the typical all-night diner food. With its pleasant, boisterous atmosphere and competent waitstaff, I highly recommend FuRaiBo for a casual and fun night out.